Our Committee meeting followed the traditional Janus pattern of looking back and forward. We looked back over the six months since our formal recognition, and were pleased to realise that we had generated over £250 worth of funds, run five public walks, set up a website, started to build a following of walkers, undertaken many hours of path clearance and generally made something of an impact around the town. 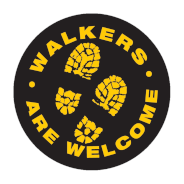 As part of our continuing accreditation, we are required to submit an annual return to the central Walkers are Welcome organisation, and we approved that at our meeting. We also thought it would be good to make that information available to anyone else interested, so you will now find our Annual Report on this website. We hope you enjoy reading it - please do pass it on to anyone else you think might be interested. further walks, all with a difference, for the later public holidays (May Day, Spring Bank Holiday, Late Summer Bank Holiday and Christmas and the New Year - wow, another year has gone by!